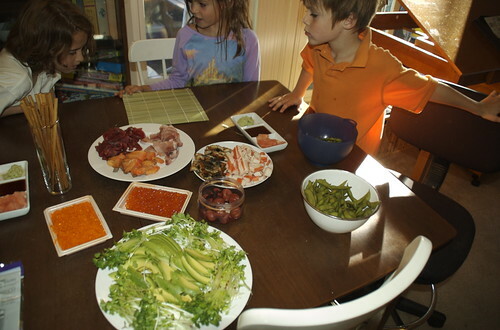 We had friends over for a sushi-fest today. After a few false starts (naps, visits to the pool, last minute run to the Japanese Market…), we finally got going. It was our first attempt and I’m happy to report it all tasted quite authentic. The only stove-top cooking was to follow a recipe for the rice from the back of the noori package, and Lauren’s Miso soup. Other than those two, we just cut up and set out all the other ingredients, and each person got to make their own sushi rolls.